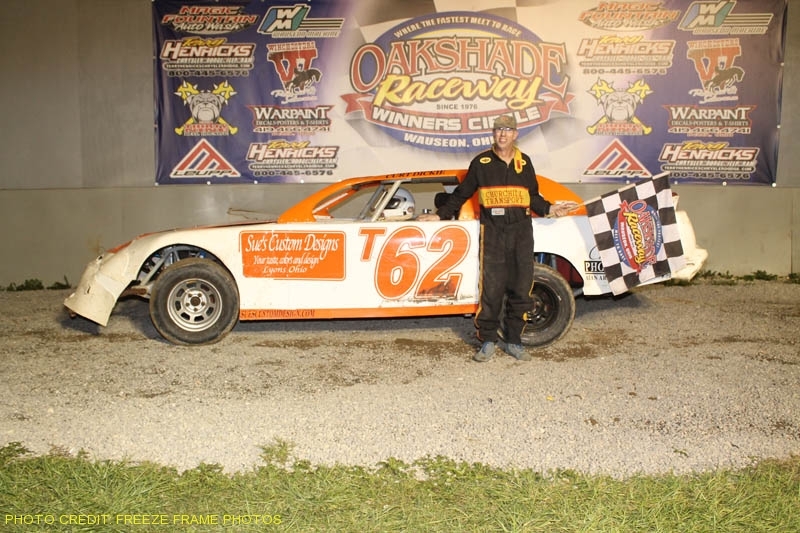 Jon Henry’s narrow win in the UMP Late Model feature at Oakshade Raceway highlighted an incredible weekend of racing action with close finishes in racing events on both Saturday night and Sunday afternoon. Things heated up quickly in heat race action on Saturday night when Josh Scott’s UMP Late Model got upside down in a multi-car wreck on the backstretch that involved last week’s feature winner Matt Miller. Scott was not injured, but his car was done for the night. Miller was able to make repairs and race his way into the feature through one of the two UMP Late Model consolation events. Chris Keller led the first two laps of the UMP Late Model feature. After a caution on lap two, Jon Henry took command on the restart. One lap later, Dan Wallace spun on the backstretch and Matt Miller slowed to a stop at the same time. Both drivers went to the pits. Andrew Reaume from Blenheim, Ontario, Canada got by Keller on the restart to move into the second position. Reaume, looking for his first ever Oakshade feature win after coming close on several occasions, stayed right with Henry as the two raced for the lead all the way to the finish. Brian Ruhlman closed in on the leaders to make it a great three-car battle for the lead late in the race. With all three drivers vying for position, Reaume made one last run off the outside of the final corner to get up alongside Henry. With the crowd on their feet, Henry edged out a narrow victory by just inches over a disappointed Andrew Reaume. It was the 12th Oakshade feature victory for the Ada, Ohio driver. Finishing close behind in third was Ruhlman. Dusty Moore finished fourth with Casey Noonan ending up fifth. Joe Derbeck opened up an early lead in the UMP Sportsman feature race until Bob Gregory closed in and took the lead on lap eight. Multiple cautions kept the field packed tight behind Gregory throughout the race. Tim Line and Matt Lindsey got up alongside Gregory near the finish for a three-wide battle for the lead. Despite the pressure from Line and Lindsey all the way to the end, Gregory’s fast car proved too tough to beat in another close finish. Lindsey placed second with Line third. Joe Smith posted a fourth place finish and Derbeck slipped back to finish fifth. Curt Lancaster had to pass Josh Sisty twice to get the lead in the first few laps of the UMP Bomber A Main. Lancaster passed Sisty on lap two, but a caution came out and saved the lead for Sisty as the field was lined up the way they completed lap one. Lancaster made short work of getting the lead again after the restart but would only lead one lap. Tony Tolles charged his way to the front and took the lead on lap three. Last week’s feature winner, Jeff Foks, worked his way into second by lap five. Those two drivers battled for the lead all the way to the finish. Foks dove down the inside of Tolles as they entered the final corner, but Tolles had just enough to hang on and won by a nose in another side by side finish. Foks settled for second followed by Lancaster, Terry Rushlow and Amy Bernard who celebrated a birthday the day before. Not to be outdone, the youngsters in the Hornet division put on a great race that wasn’t decided until the checkered flag. Sylvania, Ohio’s Drew Smith started on the pole and led from the drop of the green flag. Taylor Dippman worked her way up to second and began to reel in Smith. Dippman caught Smith and made an effort to try to steal the victory away, but Smith was able to hold on in a close win over Dippman. William Cundick finished third followed by Josh Froelich and Brandon Myers. Chris Dachenhaus led the entire distance of the UMP Bomber B Main, but had to work for the win. 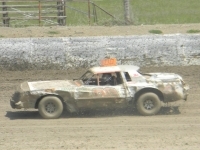 Jeff Geis pressured the Napoleon, Ohio driver for most of the race and made one last move, dropping down to the inside of Dachenhaus in the final corner of the final lap. It wasn’t enough as Dachenhaus powered off of turn four and beat Geis to the checkered flag. Dave “Gumby” Golembiewski Jr. finished third with Gregg Detray and Dan Shaffer rounding out the rest of the top five. The exciting finishes continued into the UMP Bomber C Main. Shaun Sharp took the lead at the start after starting on the outside of the front row and held that position the entire distance. Scott Robertson made it close at the end, closing in on Sharp toward the finish. Robertson came up short though as Sharp held on to pick up the checkered flag. Dylan Hough came home third with Mike Draper and Mike Grames finishing fourth and fifth respectively. The final race of Saturday night was the UMP Sport Compact feature which was the only feature not to have an close finish. Derek Morris won’t complain about that as his dominance continued in this new division at Oakshade. He jumped out to the lead at the start and never looked back on the way to his second consecutive feature win. Regan Ford finished second followed by Christopher Whitlock and Stephanie Miller. Racing action continued on Sunday afternoon with the second of seven 200-lap/2 hour Enduro races this seaon. Brian Ruhlman had things figured out early leading much of the first half of the race, but his luck soon ran out. Several pit stops put him way back in the running order and turned the lead over to Mark Henderson by the halfway point of the race. Things remained tight among Henderson, Tony Tolles, Ronnie Bloomfield Jr. and Dan Dippman for the last 100 laps of the race. Henderson lost the lead after contact with Brian Ruhlman, who had spun, cut down the left rear on Henderson’s car. Tony Tolles assumed the lead by lap 175 when Henderson pitted to get the tire changed. Tolles got into trouble within the final 25 laps when he spun around in turn two after contact from Dan Dippman. That allowed Henderson to make up some ground and eventually reclaim the lead within 10 laps remaining. Tolles had fallen back about a straightway behind, but began to close back on Henderson in the final few laps. Tolles just about caught Henderson at the end, but finished about two car-lengths behind Henderson as each driver completed 200 laps. Ron Bloomfield Jr. edged out Jeremy Grover for third with both drivers completing 198 laps. Finishing in fifth, one lap behind Bloomfield and Grover was Dan Dippman. Racing excitement continues next weekend at Oakshade Raceway with a full racing program on Saturday night of UMP Late Models, UMP Sportsman, UMP Bombers, Hornets and UMP Sport Compacts. Gates open at 4pm and racing starts at 7pm.